This week EWG analyzed recent testing results of the harmful weed killer glyphosate in oat-based foods and calculated that the possible carcinogen was found at higher concentrations in two brands of kids’ cereal than certain added vitamins. 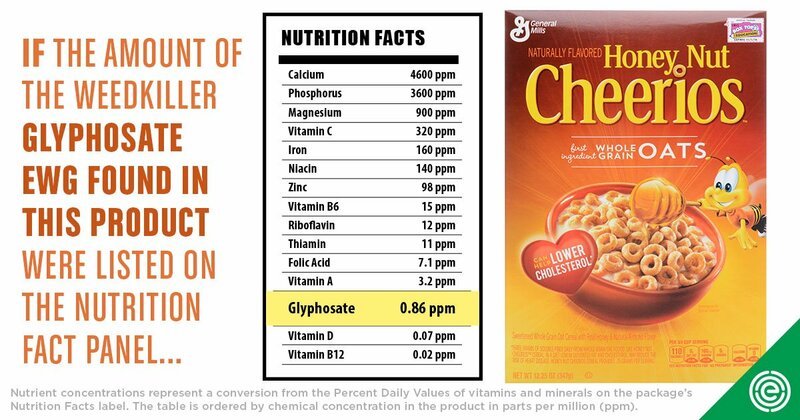 For example, tests of a sample of General Mills’ Honey Nut Cheerios had higher amounts of glyphosate residue than of added vitamins D or B12. On Thursday, the National Toxicology Program released a groundbreaking study, which found “clear evidence” that radiation from cellphones had ties to cancer. This reaffirms EWG’s recommendation that everyone, especially children, should exercise caution around their mobile devices. EWG applauded the Food and Drug Administration for finally enacting a long overdue ban on the ingredient lead acetate in hair dyes. A common ingredient in dyes that darken gray hair, lead acetate has links to increased lead exposure. As the farm bill debate ramps back up, we reviewed recently added data to our Farm Subsidy Database and found that more than 20,000 residents of America’s 50 largest cities collected farm subsidies in 2017. And finally, California Baby®, a leading skin care brand, received the U.S. Department of Agriculture’s Certified Biobased Product label for a new plant-based preservative it will use in its products. EWG celebrated this achievement, hoping that it continues the trend of industry taking steps to protect consumers. “Lead is a potent neurotoxin with no safe level of exposure and it is reasonably anticipated to be a human carcinogen,” said Melanie Benesh, Environmental Working Group’s legislative attorney. We now know that the approved use of lead acetate in adult hair dyes no longer meets our safety standard." The Environmental Working Group, one of a dozen groups that petitioned the FDA for the ban, said the decision is long overdue. The Environmental Working Group, one of a dozen groups that petitioned the FDA for the ban, said the decision is long overdue. “There is no safe level of lead exposure,” Melanie Benesh, a legislative attorney at EWG, says in a statement. Tests found more of the weed killer glyphosate than of some vitamins in samples of oat-based breakfast cereals marketed to children, an Environmental Working Group analysis shows. Reprint of EWG news release. The Environmental Working Group says in a news release that tests detected glyphosate in all 28 samples of products made with conventionally grown oats. All but two of the 28 samples had levels of glyphosate higher than what the group's scientists consider safe, 160 parts per billion (ppb). In a new study by the Environmental Working Group (EWG), all samples of oat-based cereals tested were found to contain glyphosate, the key ingredient found in Monsanto’s (now owned by Bayer AG) RoundUp and other weed killers. This new French study comes on the heels of Environmental Working Group’s recent testing that detected glyphosate in cereal. It appears that Monsanto’s Roundup and other pesticides are downright dangerous for our health. Released by the Environmental Working Group (EWG), the report found 26 of 28 oat-based cereal products that were tested had ‘harmful’ levels of glyphosate, the main ingredient of Roundup. Products included variations of Cheerios and Quaker Oats, including Honey Nut Cheerios, Quaker Oatmeal Squares Honey Nut, and Quaker Overnight Oats. More than two dozen common oat-based breakfast products that are marketed to children contain small amounts of a weed killer called glyphosate that may pose a cancer risk, according to the Environmental Working Group (EWG). KFOR (Lincoln, Neb. ): Is trace amount of herbicide in breakfast cereals cause for concern? Just how much, if any, of the herbicide can be considered safe is a matter of long-running scientific and legal debate. The Environmental Working Group’s standard for what’s acceptable is not, by far, the most conservative. According to an analysis performed by the Asbestos Disease Awareness Organization (ADAO) and the Environmental Working Group (EWG), asbestos imports rose from 13 metric tons in July to 272 metric tons in August, an increase of more than 2,000%. “We applaud California Baby's innovative approach to developing a bio-based formula that will still adequately preservechildren's skincare products,” said the Environmental Working Group (EWG) President Ken Cook. Reprint of EWG news release. The U.S. Environmental Protection Agency and the Environmental Working Group have a list of products that meet a “safer choice” requirement. For their full list, visit epa.gov/saferchoice. Similarly, sites like ewg.org will tell you how toxic your household cleaning supplies are, you can also research your current cleaning products and the EWG will let you know how toxic they are. Babo Botanicals, certified by the Environmental Working Group, was founded in 2010 by Kate Solomon, a young mother searching for safe, efficacious, and natural products for her children. As if that weren't enough, C'est Moi also is EWG Verified (meaning it meets the very intense safe ingredient standards of the Environmental Working Group) and boasts recyclable and sustainable packaging. Sierra: Have You Been Snacking on Cancer-Causing Chemicals? Based on independent tests that showed the flavors were causing cancer in laboratory animals, the Center for Food Safety, Center for Environmental Health, Center for Science in the Public Interest, Breast Cancer Prevention Partners, Earthjustice, Environmental Defense Fund, Environmental Working Group, and WE ACT for Environmental Justice in May 2018 asked a court to order the FDA to make a final decision about banning the offending agents. Given our unique resources at the Environmental Working Group (EWG)—the Food Scores database, which rates thousands of food items based on nutrition, ingredient hazards and degree of processing; scientific expertise in GMOs, pesticides, food colors and flavors; and EWG nutritionist and mom Dawn Undurraga—we wanted to give you some ideas (beyond whole walnuts, pennies and dental floss) to help you shop a little smarter and a little healthier this year. Opt for organic strawberries. The Environmental Working Group, which analyzes U.S. Department of Agriculture pesticide-residue data, has found 13 different pesticide residues on conventionally grown strawberries. The nonprofit Environmental Working Group, which releases a yearly review of hundreds of sunscreens, has seen a rise in the availability of mineral sunscreens that don’t contain oxybenzone or octinoxate, or any chemical sunscreen ingredient at all. They rely instead on the FDA-approved ingredients zinc oxide or titanium oxide. Water tests show that 110 million Americans have levels of PFAS in their water that the most cautious scientists call unsafe, according to the Environmental Working Group, a non-profit organization that advocates for public health issues.